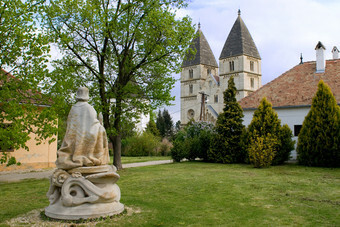 In 2005, in order to present the outstanding monuments of the life and cult of Europe’s most popular saint St Martin, the road leading from Szombathely to Tours was declared an European Cultural Itinerary by the Council of Europe. The saint bishop of Tours was born in 316 A. D. in the ancient town of Savaria, Pannonia (today the city built on Savaria’s sites is called Szombathely). Son of a military tribune, he was enrolled at the age of 15. Among the soldiers of the Roman Empire he excelled both with his kindness and his compassion for the sick and the poor. Fascinated and attracted by religion, which led to disputes with his father, he was baptized three years later in Amiens where he shared his coat with a beggar. Jesus told Martin in a dream that he was the beggar to whom Martin had done good. Influenced by this vision, Martin became Christian. He left the army in Worms to devote himself to his apostolate. He then traveled to Poitiers and became the disciple of Saint Hilaire who ordained him priest. During a visit to Savaria, he tried in vain to preach the Gospel to his parents before finally leaving his birthplace for good. According to another tradition he baptized his mother. Later he founded the Ligugé monastery in Poitiers on the banks of the river Clain. Disciples joined him and his reputation spread throughout Gaul. He was elected bishop by the Christian community of Tours on 5th July, 371. He tried to hide from this position into a poultry house, but was given away by the cackling of geese. That’s the reason the goose became Martin’s symbol. As a bishop he became very popular by his goodness and charity as well as his singular eloquence. He died in November 397 at the age of 80, in Candes, within the confinesof his diocese. To protect his body from the claims of the people of Poitiers, the locals transported him by boat to Tours by night. His tomb, on the Santiago de Compostela road, very soon became a center of pilgrimage. He became the patron saint of the Frankish kings and Gaul, and his veneration spread all over the world. In Europe several thousand settlements and churches bear his name. The Via Sancti Martini – the Saint Martin European Cultural Route operates within the network of the Réseau Européen des Centres Culturels Saint Martin – an independent non-political and non-denominational organization. Each member organization is a NGO [Non-governmental organization] – with Tours as its administrative centre. The chair-person is elected annually and each year being delegated by a different member country (2014 Slovenia, 2015 Italy). In response to the proposal put forward by Institute of European Cultural Routes, the European Council due to its exceptional importance in May 2013 has declared the Via Sancti Martini “Cultural Route of the European Council” for another three-year period. 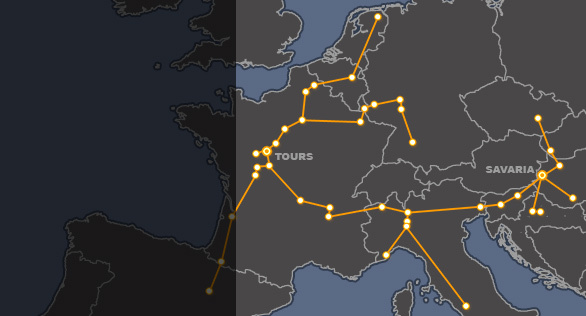 follow his paths across Europe!